This is a review of the Toe and Foot antifungal nail treatment which is manufactured by Telia Oils. This product claims to kill fungal infections in and around your fingernails and toenails in fewer than four weeks. Read on to learn if this product is right for you and your symptoms. Oregano oil is often taken to treat respiratory tract issues as well as gastrointestinal problems. It is said to treat intestinal parasites, allergies, sinus issues, cold symptoms and fatigue. 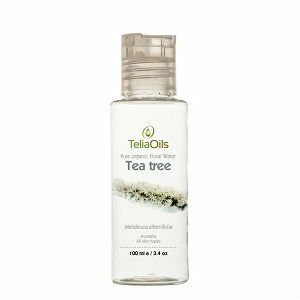 Tea tree oil is a very popular essential oil that is used for a wide variety of ailments and skin afflictions. It is commonly used for acne, cuts, scrapes, warts and fungal infections. It is said to have antibacterial, antifungal and antiseptic properties. Echinacea is often used to treat infections and cold-like symptoms. People have used echinacea to treat skin conditions like eczema, psoriasis, herpes, and wounds. Chamomile is often used for people who are restless or have trouble sleeping. It has also been proven to be successful in reducing anxiety in people with anxiety disorders. It is occasionally used to treat skin irritations but its efficacy in this role has not been proven. The oil comes in a glass bottle and includes a brush so that it can be applied to the affected area. To use this oil, brush it onto the affected area twice a day, every day for four weeks. If this product is being used to treat the finger nails, make sure not to wash your hands or eat for up to 10 minutes so that the oil can be properly absorbed. If you experience a heat sensation after applying this medicine, this is normal and it will dissipate. Oregano oil is unsafe to take if you are pregnant or breastfeeding because there are concerns that too much oregano can cause a miscarriage. Oregano oil may also interact badly in people with bleeding disorders. People who are allergic to the Lamicaea family which includes lavender, basil and sage may find that they have an allergy to oregano as well. Echinacea is mostly safe for short term use. However, it may cause side effects in some people. These side effects include nausea, fever, vomiting, stomach pain, sore throat, dry mouth, headache, and dizziness. Echinacea may cause allergic reactions in people who are allergic to ragweed, daisies and marigolds. If you have an auto-immune disease, avoid echinacea because it may have a negative effect on the immune system that will make your disorder worse. If you have an allergic reaction to plants like ragweed, chamomile may cause you to have an allergic reaction. Chamomile can also cause eye irritation if it is near the eyes. If you have a condition that is sensitive to changes in estrogen, it is best to avoid chamomile. This product is available on Amazon for $9.90 plus shipping. The size of the bottle is .33 ounces. This product is not listed for sale on the manufacturer’s website. The website does not offer a return policy or guarantee for its products. There is no guarantee listed by the manufacturer on Amazon or on their website. There is only one customer review available on Amazon for this product. This product claims to offer a noticable improvement in fungal infections on the your nails in only a few days. If applied correctly, the oil claims to be able to relieve you of fungal infections in your finger nails and toenails in only four weeks. While this product is inexpensive, it is not sold by the manufacturer on their website. It also seems that this product is only suitable for treating one aspect of fungal infections and not the infection as a whole. Jimmy Rodriguez	reviewed Telia Oils Toe and Foot	on June 11th	 and gave it a rating of 2.5.